As much as you are excited about the thoughts of owning a dog, you have to be aware that you will surely outlive your dog. And that means that while you might enjoy playing with them during their puppy years, you must also care for your senior dog when they are in their twilight years. 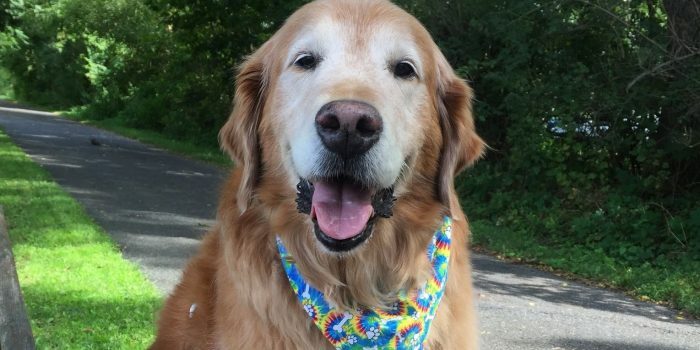 It is pretty perplexing to see owners neglecting or even abandoning their senior dog when they are older, simply because the owners themselves are not prepared for this stage. I adopted my dog Cooper 11 years ago at the young age of 16 months from a rescue. He’s now a happy senior at age 12.5 years old! Is caring for your senior dog a tough thing to do? Or what are the things that you can do so that you can care for your senior dog? As per humans, dogs who are overweight will certainly experience pain as well as difficulty in walking due to the pain on the joints. This is one of the reason why you should always keep your dog fit during their younger days. Also, since muscles do degenerate over time, it is important for you to keep your dog active so that the muscle degeneration rate is much slower. Of course, all of these are to be supported with a healthy diet too! Swimming is a great way for your dog to get exercise and is easy on his joints. Almost all dogs will suffer from arthritis, and this is especially true for all large breed dogs. When this happens, it will be tough for you to keep the dog fit as they will be in extreme pain if they do so. As such, one of the best ways to care for your senior dog is to provide to them with proper supplements. With adequate vitamins as well as other necessary vitamins, you will be able to alleviate some of the conditions that your dog is suffering from. This is often missed out by many dog owners. If left unattended, dental illness can represent an issue! Statistics shows that many pets develop dental infection when they are in their infant stage of the life. And when this goes unchecked, the dog might have zero teeth when they are older! Dental sickness can be excruciating, making your puppy dodge or experience issues eating his dinners. Imagine not being able to chew on your favorite food! It is paramount that you keep your senior dog’s teeth as healthy as possible. And one of the ways is to brush the teeth regularly or to provide to them treats that helps to keep the teeth clean. You should always schedule regular visits to the vet. We will recommend you to bring your senior dog at least twice a year to the vet for their regular inspection. With this, it will be easier to detect any possible health issues before they start to develop complications. The logic is pretty simple. There might be many symptoms that we are not aware of, and if we let it continue, it will cause much more discomfort to the dog. Also, we like to nip the problem in the bud, so having these regular checks will surface up many issues that we can solve. Also, it is much cheaper to go for regular visits rather than paying for treatments when the issue is found out much later! When the dog gets older, they might not need nutrients that are much needed when they are younger. Or, their calorie intake should be lower too. As such, it will be important for you to check on your senior dog’s diet. As a guideline, we always love to include with good fatty acids into the senior dog’s diet. Fatty acids like the DHA and EPA are known to be extremely important when it comes to dogs with mobility issues. Other supplements such as the glucosamine will obviously be good for senior dogs in helping them alleviate issues that are related to their joints. What if your senior dog has other health issues? If that is the case, once you know the dog’s exact issues, you will obviously need to administer the dog’s proper medication to them. Also, as an additional measure, you should always try to reduce your dog’s sodium intake, especially if they have heart or kidney problems. You should try to increase your dog’s intake of calcium too as this will help to combat bone related issues. For older dogs, they will almost certainly slide on the floor, especially for hardwood floors. In that case, what are the measures you can take so that you can take care of your senior dog and not let them slip on hardwood floors? For starters, you will need to trim your dog’s nails as well as keeping the hair around the foot trimmed too. With a shorter nail, it will be easier for your dog to have a better grip on the floor. Also, with shorter hair around the foot, you will be eliminating the possibility of your dog slipping on the floor just because they have stepped on their own fur! Carpets or an anti-slip mat can be strategically placed on areas of the floor that the dog usually frequents. I’ve noticed that just putting a carpet remnant at the bottom of my staircase over the hardwood has helped my senior dog Cooper tremendously getting the umph to get up the stairs! How do ToeGrips (nail grips for dogs) work? Dogs use their toenails for traction. They flex their paws and engage their nails like soccer cleats digging into the ground. But hard nails can’t grip hard floors. ToeGrips are nail grips for dogs that work by allowing the toenails to grip smooth surfaces like hardwood floors. Unlike dog socks and boots, which interfere with a dog’s paw and toenails (natural gripping mechanisms), ToeGrips create a Grip Zone™ that works with your dog’s innate biomechanics. The Grip Zone™ allows the the toenails to meet the floor for traction with every step…naturally. The non-slip nail grips fit onto your dog’s toenails to enable instant traction on hard-surface floors and stairs. Once placed on the toenails, ToeGrips are made for indoor/outdoor use, can be worn constantly, and typically need to be replaced every one to three months. We all love our dogs, and the dogs will really need that love during their twilight years, As we are in the power to decide on the quality of life that the dog has, we should always be doing our best for our dogs!